All they wanted was to look like a band – and to feel like one, too. 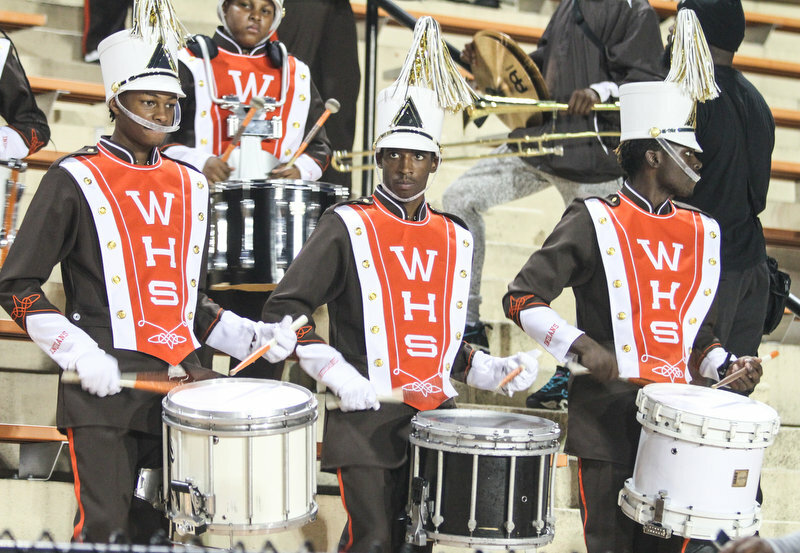 On Friday night in Newark, the Weequahic High School marching band finally got a chance to experience the musical tradition of Indian nation. They had extra bounce in their step and played a little louder as they debuted new uniforms during a home football game at Untermann Field. “We looked good for the first time,” said Stephon Waddell, a 17-year senior and trumpet player. “We looked like superstars out there.” What’s the big deal? Why should we care about what a bunch of high school musicians are wearing? Well, those stylish orange and brown outfits – which filled the band members with pride and confidence -exist because of you, the reader. I wrote a column last year about the dedication of these kids to stay in the band despite their less-than-ideal appearance. Many of you read the piece and opened your wallets – to donate $30,000 – so the band could look like a million bucks and play instruments that didn’t appear as if they were held together with tape and glue. For five years, they had resembled anything but a band. “They looked like a bunch kids playing instruments, walking up the street,” said Darryl Taylor, the assistant band director. After the official uniforms fell apart, band members wore track suits, then orange jumpsuits that resembled prison gear. Khaki pants and polo shirts were a little better, but they were replaced with orange hooded sweatshirts and brown sweatpants that quickly faded. The band, however, stuck together and continued to practice — even when they hadn’t performed in seven games. There weren’t enough uniforms for everyone to wear and several instruments needed to be repaired. The students leaned on Taylor, who has been the force to keep them from quitting. An alumnus of the band, his 29 years of volunteering shows that he cares. His commitment is a gift for band director Michael Page, who leads the music program that steers these kids off the streets. Both men spend two hours, sometimes more, after school practicing with the young people, who also receive coaching from Taylor’s son, Darryl Jr.; and his brother, Jamal Littles; and other alumni who were in the band. When the story appeared, the Weequahic High School Alumni Association was stunned to learn about the band’s struggles. Its members immediately started a campaign that gained support in a hurry. Joanne Williams, a 1984 graduate, hit up Newark bodegas, collecting $1,700 on her own in a weekend. The Newark Police Department jumped in and the city fire department raked in funds at busy city intersections and highway exits. One reader paid the $3,000 bill for new drums and harnesses. The band also had appeared on “The Meredith Vieira Show” to talk about their situation. “Look at them,” Williams said Friday night. “They look beautiful.” They were sharp. Gold and white plumes stood upright on their gold and white hats. Fastened to the front of their brown jackets, with gold buttons, was an orange and white overlay bearing the letters WHS. An orange stripe ran down the side of brown pants that stopped at white spats covering their shoes. 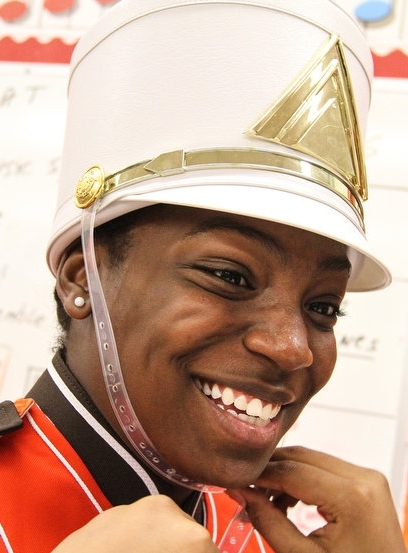 “These uniforms look so dope,” said Nadiyyah Smith, a 17-year-old senior who plays clarinet. “Dope” is a good thing, in case you were wondering. Beverly Thomas, class of 1982, had a one-word review, too. “Fabulous,” Thomas said. “I just pray they take advantage of this opportunity and take care of them,” she said. It’s probably a safe bet that these uniforms stand a greater chance than the last ones, considering what the band has been through, and, for instance, Taylor’s rules on what cannot be eaten when they are worn. No chocolate, no soda, no mustard, ketchup or hot sauce – and absolutely nothing with grease. Everyone had a good time. The football team routed Cedar Grove High School, 42-0, to stay undefeated at 4-0. After the game, the band continued the celebration. The drummers marched around cars stopped at the a nearby traffic light. The rest of the band marched on the sidewalk until everyone came together at the high school entrance. There, they danced their way down a “Soul Train” line. It took five years for them to feel this kind of joy, to feel like they finally belonged. The truth of the matter is that they were legit all along.